A call to all the progressive and democratic forces to build communication and cooperation channels between them was made during Progressive Caucus’s* big event in the European Parliament (27th of November) under the title ‘The European Integration in front of new challenges – The role of Progressive Forces’. The Progressive Caucus MEPs welcomed to an open discussion, which had great attendance, the Presidents of the three groups in the EP –together for the first time. Udo Bullmann (Socialists), Ska Keller (Greens), Gabi Zimmer (Left) participated at the fruitful debate, as well as representatives from the parties SYRIZA (Costas Douzinas, MP – Greece), RAZEM (Agnieszka Dziemianowicz-Bak – Poland), Generation.s (Sarah SoilihiÂ – France), Ecolo (Evelyne Huytebroeck, MP – Belgium). The participants stressed the importance of building alliances against neoliberalism and the far right or extreme forces, not only on the institutional level -inside the EP- but also with the civil society, as well as alliances based on international cooperation of the left, progressive and democratic forces. They also mentioned that these alliances should focus not only towards the upcoming European Elections at 2019, but also after them, otherwise the project of the European Union will be under heavier risks. During the open discussion, which took place, MEPs from the groups of the Socialists, the Greens and the Left, as well as representatives from NGOs and other external participants, took the floor. Among them, Maite Mola, vice president of the Party of the European Left, who brought to the discussion the paradigm of the European Forum of Left, Progressive and Ecological Forces, which took place in Bilbao earlier in November. In addition, participated Louka Katseli, co-chair of the Independent Commission for Sustainable Equality, who briefly announced the results of the Sustainable Equality Report, presented earlier the same day in the EP. The opening speech of the event was made by the member of the Steering Committee of Progressive Caucus and Vice-President of the European Parliament, Dimitrios Papadimoulis, who mentioned the need for â€˜progressive forces to have a clear stance and posture’. ‘Against the Commission proposals, we counter-argue for our scenario that provides concrete answers for EU and Eurozone, tackles hate speech and nationalist decline, and the surge of far-right parties’, he said. ‘We have to create a strong progressive alliance that can play a decisive role in EU level, to combine realism with radicalism, to balance between Î± visionary approach and pragmatismâ€™, he added. MEP Eva Joly, member of the Steering Committee of Progressive Caucus, coordinated the first round of discussions, under the title ‘The challenges of turning Europe to a progressive direction/ Past and upcoming challenges for making Europe more progressive’. Beyond our differences, we as European progressives must absolutely learn to talk to each other and act together. The Progressive Caucus is built upon this common will. I know our differences, but I also know the weight of conservative forces and the determination of the euroscepticals. To address the challenges, be convinced that the answers will come from our ranks’, she said and gave the floor to the three Presidents of the groups participating. ‘Europe is the answer to our problems, but not this Europe we are in. We need radical changes, on the name of citizens’ needs’, mentioned Udo Bullmann (Socialists), and continued: ‘We have to change the path of the insane development of capitalism. We need radical transformation on economy, environment band social dimension’. ‘We invite all democratic forces to support us in this project for a better Europe. The discussion of the Progressive Caucus is an ideal prelude for this’, he stated. Ska Keller (Greens) highlighted that ‘European Union’s founding principles are very progressive, but it has to give answers to the challenges we have today, such us peace and climate change, and also inequalities’. ‘Europe has to deal with security risks, prosperity of the people, tax evasion. We cannot allow super strict economic rules, but when it comes to social rights just rely on ideas! A single member state cannot find ways out from this’, she continued. Gabi Zimmer (Left) said that ‘we need specific policies that will bring changes, we need a totally different route from our governments, we need to clarify our priorities, we have nothing to do with “Orban’s” politics and far right’. ‘We need a Europe of social nature, and we need to figure out how we imagine EU integration‘, she concluded. The second panel of Progressive Caucus’s event was coordinated by the member of its Steering Committee, Ernest Urtasun, who welcomed this initiative to build ‘a common space of dialogue and action for the left forces in Europe’. During this round of the debate, Greek MP Costas Douzinas stressed that the progressive and left forces have ‘an extraordinary opportunity for two projects; assembling a new progressive left and create a Europe for the people, from the bottom up‘. ‘The combination between official politics and movements brought SYRIZA in Greece in power’, he brought as an example. Agnieszka Dziemianowicz-Bak from the polish party RAZEM intervened by mentioning the problem of the inequality of political rights of European citizens. ‘The political crisis in western countries is rising. It’s the time to make residency the legal base of voting rights’, she said among else. ‘Ι never thought there were irreconcilable left’, said Sarah Soilihi from the french party Generation.s, and called the citizens to demand together a Europe more social, more human, more ecological. ‘In a context of citizens’ anger and low wages, it is up to the union of progressives and ecologists to fight for more social, fiscal and ecological justice’, she mentioned. ‘We have no choice but to make Europe stronger and combat populist solutions’, said Belgian MP Evelyne Huytebroeck. ‘There are differences between us, but there are more things uniting us. We need to be based on those, otherwise we will not win. We need a common voice’, she stated. MEP Florent Marcellesi, member of Progressive Caucus’s Steering Committee, coordinated the open discussion that followed, and highlighted that ‘we have answers to give for Europe’. What we need, as he said, is ‘a social movement to fight against ‘Salvinis’ and ‘Lepens’, by offering a hopeful European project based on both sustainability and solidarity, that’s on real solutions and strong valuesâ€™. MEP Georgi Pirinski, also Progressive Caucus’s Steering Committee member, stressed three points. First, no more taxes for climate change measures -the banks must pay; second, decent jobs for a decent life in every member country; third, sovereign democracy of the people as the only way to ensure a Social Europe. Therefore, he said ‘yes to the Sustainability Equality Report’, (briefly presented by its Independent Committee Co-Chair Louka Katseli) and its proposal for a Sustainable Development Pact instead of the austerity-driving Stability and Growth Pact’. Summarizing the outcome of the big event, which gathered great attendance, MEP Guillaume Balas, Progressive Caucus’s Steering Committee member, said: ‘We made it to work together, to debate with civil society, we talked with more than 150 NGOs, we gave the floor to the leaders of progressive parties’. ‘That’s our way. We need to exist all together. Is it too soon, as some say? Or just too late?‘, he asked, praising the role of Progressive Caucus in the EP, which started working unitedly five years ago. Italian MEP Elly Schlein, Progressive Caucus’s Steering Committee member, intervened at the end of the event to say that ‘we need a European progressive, democratic and environmentalist front’. ‘We are here to make an EU of more opportunities. Multinationals are stealing our future by avoiding billions of euro, but when the progressive and green forces gathered we won important fights in this Parliament’, she said, mentioning the solidarity movement towards the refugees, among else. ‘With the Progressive Caucus we managed to stick together in the European Parliament. That’s the route we need to continue and shape a common vision of the future, this is the heritage we have to give to the next EU parliament after 2019‘, she concluded. *The Progressive Caucus is a space of dialogue based on confidence-building and open debate. 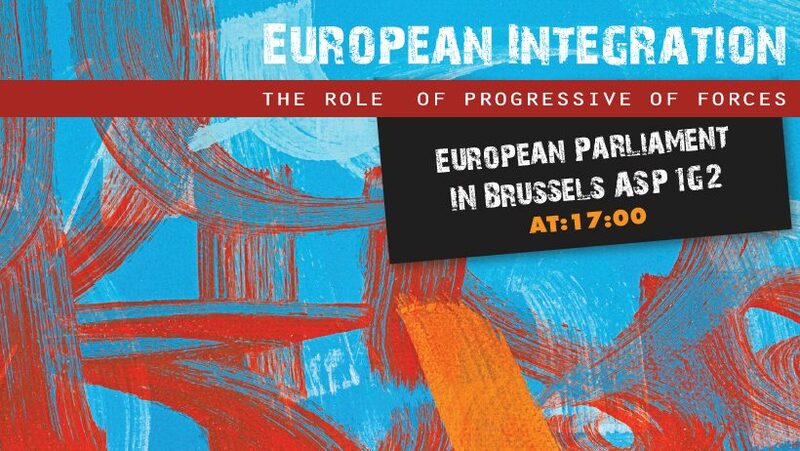 Its aim is to analyze differences and build bridges between progressive allies in the European Parliament and across Europe. It has been established by progressive MEPs of different political groups and is open to everyone in the community of the European Parliament standing for solidarity, democracy, social justice and sustainability. In the Progressive Caucus participate MEPs from the S&D, the Greens/ EFA and the GUE/ NGL groups.